Liposuction procedures have advanced to the point that they are no longer intense, invasive procedures thanks to the cutting-edge laser technology in equipment such as the LipoLite Laser System from Syneron. Using carefully designed laser technology, Syneron has been able to develop a system that delivers effective results with only a minimal risk of side effects. Syneron is a fast-growing company that combines technological advances with streamlined design. Their products strive to deliver the best clinical results for aesthetic treatments by committing themselves to the science of healing.The number of treatments that their equipment has provided to patients across the globe provides ample evidence of the kind of results that they achieve. Syneron serves customers by developing the very best equipment and by setting the highest standard for clinical, technical, and marketing support. 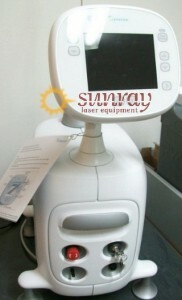 The system makes use of a 1064nm, Nd:YAG laser that performs ideally when it comes to lipolysis. In combination with the VelaShape II, the LipoLite can be used to firm body tissue and remove cellulite for concerned patients. Provides a dramatic reduction in the expense to patients when it comes to lipolysis. The equipment is proven to be durable and meets the strictest standards set out for equipment of this kind in the industry. The discomfort to patients is virtually non-existent, and the results are almost immediately discernible. The light-weight unit takes up very little space in the office and is sure to expand any clinics potential customer base. This unit is available at the most competitive pricing when users explore their refurbished options made possible by SunrayLaser.Com. Our knowledge when it comes to working with refurbished equipment aimed at aesthetic rejuvenation is unparalleled. We guarantee only the highest-quality equipment that will ensure that your practice meets its full potential. Contacting us today can open the doors to patients who may think that such ground-breaking treatments are beyond their reach.